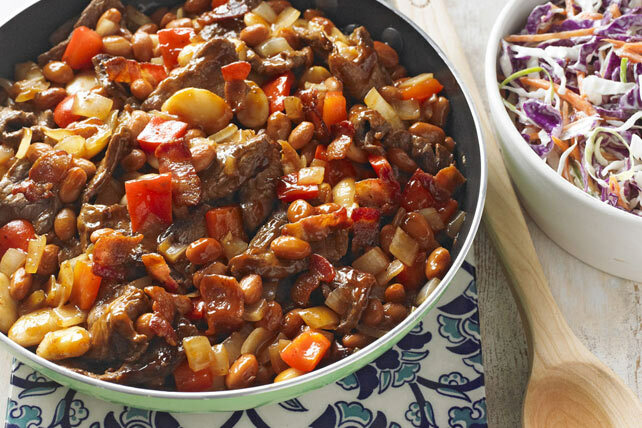 Cowboys and cowgirls alike will come a-runnin' when the smell of beans and sliced sirloin steak comes waftin' off the skillet. Cook steak strips in large deep nonstick skillet or Dutch oven on medium-high heat 3 min. or just until no longer pink in centers. Transfer to plate. Add bacon to skillet; cook on medium heat 1 min. Stir in onions and peppers; cook 6 min. or until bacon is done and vegetables are crisp-tender. Add beans and barbecue sauce; mix well. Simmer on medium-low heat 5 min., stirring occasionally. Return steak and any juices from plate to skillet; cook 1 to 2 min. or until steak strips are done, stirring occasionally. For a spicier dish, add 1/4 tsp. crushed red pepper or 1/2 tsp. hot pepper sauce to ingredients in skillet with the beans and barbecue sauce. Substitute a green pepper for the red pepper.